Several Visio 2013 templates take advantage of the properties of containers and lists to enhance ease of use and to add valuable features. In this section, you will discover three examples. The framework that holds swimlanes is a list. Each swimlane is a container. 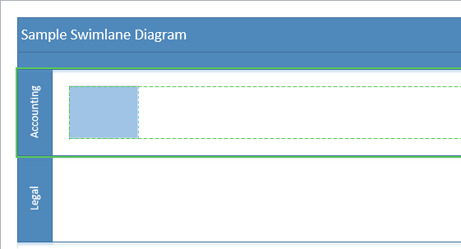 Because Visio 2010 swimlanes also use containers, if you open a 2010 swimlane diagram in Visio 2013, it will open directly. 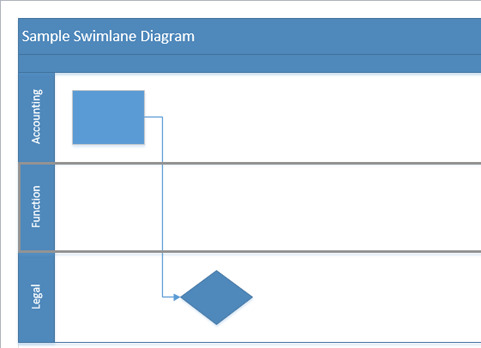 However, if you open a swimlane diagram created in an earlier version of Visio, it will be converted to the new swimlane structure and cannot subsequently be edited with the older software. To protect you, Visio presents the dialog box shown in the following graphic so you have the opportunity to save the older version of the diagram if you want to. In this exercise, you will create part of a swimlane diagram to understand how lists and containers are used. SET UP Click the File tab, and then click New. Click Categories, click Flowchart, and then double-click the Cross-Functional Flowchart thumbnail to create a new drawing. 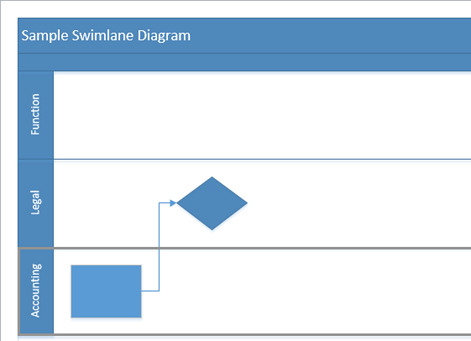 Click the top edge of the CFF, and then type Sample Swimlane Diagram. Because the CFF structure is a list, the text you typed appears in the list heading. Click the rectangle at the left end of the upper swimlane, and then type Accounting. Because the swimlane is a container, your text appears in the container heading. Click the rectangle at the left end of the lower swimlane, type Legal, and then press the Esc key. The following graphic shows the results of steps 1, 2, and 3. Drag a Process shape into the Accounting swimlane. Notice that the swimlane shows the green border that you previously learned was characteristic behavior for containers. Drag a Decision shape into the Legal swimlane and position it to the right of the Process shape in the Accounting lane. Drag the AutoConnect arrow on the right side of the Process shape to link that shape to the Decision shape. Position the cursor just outside the CFF frame at the junction between the Accounting and Legal swimlanes (the pointer is visible in the following graphic). If the insertion bar isn’t visible when you first position the cursor near the lane boundary, pause just a moment longer and it will appear. The presence of the list insertion bar on the boundary between the Accounting and Legal lanes provides visible evidence that you are working with lists. Also, be sure to note the blue insertion triangle that appears at the end of the insertion bar. Clicking the blue insertion triangle automatically adds the default insertion object at the insertion bar location. Not all lists have a default insertion object. If you click the blue insertion triangle on a list without a default, Visio will insert a copy of one of the adjacent list members. Click the blue insertion triangle, shown in the previous graphic. 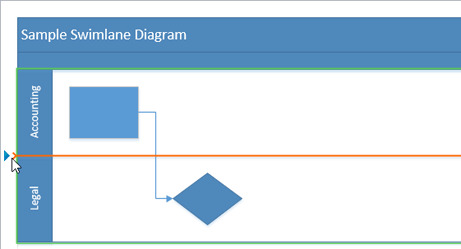 Visio inserts a new swimlane between the other two and maintains all existing connections between shapes in the lanes. CLEAN UP Save and close your diagram if you want to keep it; otherwise, just close it. Adding, deleting, and rearranging swimlanes is more predictable and logical in Visio 2013, because containers and lists provide the underlying structure. Swimlane diagrams derive another benefit from being built as containers: shapes in the container know they are contained. 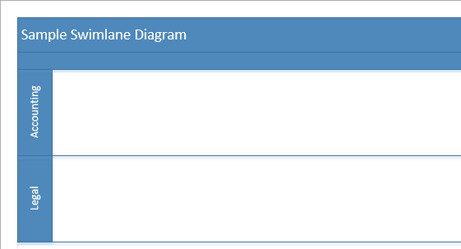 To find evidence of this, examine the Function field in the shape data for any flowchart shape in a swimlane. As an example, the following graphics show the shape data for the process shape (on the left) and decision diamond shape (right) from the preceding graphic. The value in the Function field is derived dynamically from the swimlane heading; if you change the value of the swimlane title, the Function field will be updated for all contained shapes. SEE ALSO For more about swimlane containers, go to the Visio development team blog at blogs.msdn.com/b/visio/archive/2009/09/01/cross-functional-flowcharts-in-visio-2010.aspx. The following section applies only to the Professional edition of Visio 2013.